Being a good coach goes far beyond the walls of a Box. You need to be concerned with the daily habits of your athletes as well. I’m a coach and I know pretty well what my athletes do 60-90 min a day, because I have programmed their training. I know how they warm up, train and cool down. I know when it’s deload week and I know when my athletes push their limits hard. I know their strength and conditioning levels. Those are the things I can control as a coach. But is that enough? We coaches get easily obsessed about creating the “ultimate training program” for our athletes. We spend hours and hours writing down the perfect formulas for completing workout after workout. We calculate the percentages and make time domains and heart rate limits. But do we actually pay enough attention to what our athletes do outside the gym? I can only speak for myself, but that’s the thing I want to work on with my athletes even more. What about the other 23 hours of our day? Are those hours spent supporting your training? Did you get a good night sleep? What about your nutrition and meal timing? Time spent in the gym plays only a part of your overall athletic development. If you slept only for 4 hours, skipped your lunch, sat all day in your office and then you arrived at the the gym ready to hit a new pr, it´s unlike to happen. At least this is the most common scenario, sometimes just the opposite happens. But the point is that you have not optimised the situation for yourself and your chances of hitting that new PR. One of the things that separate athletes who succeed and athletes who don’t are those “other 23 hours”. If we take a look at any elite level athlete, they optimise “the other 23 hours”. Meals don’t get skipped when travelling, because snacks are packed to go. 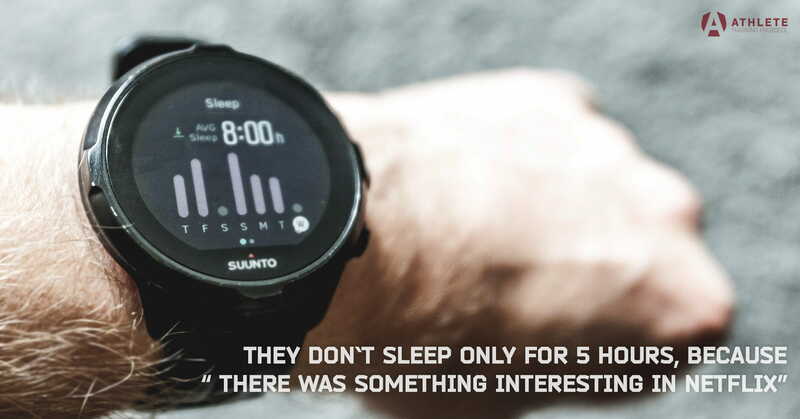 They don’t sleep for only 5 hours because “there was something interesting on Netflix”. Elite athletes don’t sit down all day long, they understand the importance of an upright position. Everything they do will support their training right down to the smallest details. They want to optimise everything because they understand the pay-off. Training is holistic. But what about us ordinary “non elite level athletes”? Do we have to optimise everything? 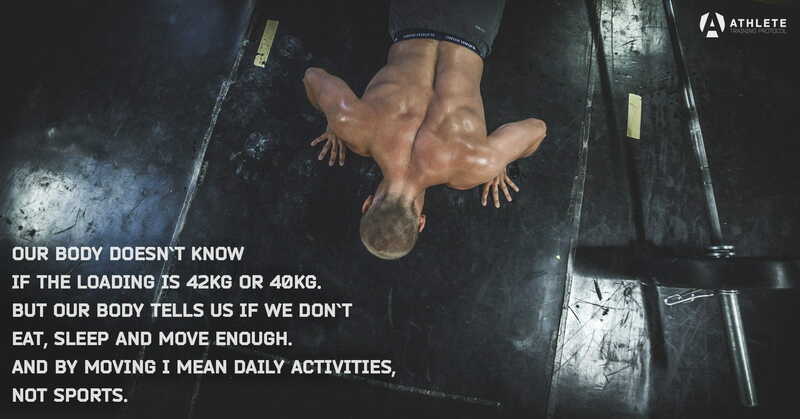 Well, it can be difficult, because we have jobs, families, obligations and a life outside the gym and competition. Optimising everything means you´ve got to prioritise. And it can be tough. We can still get a lot more out of training by changing the way we think about training. Like I said earlier, it is not just the time spent in the gym. With quality sleep, nutrition and daily activities you’ve hit the jackpot already. And those things support your health as well, not just your athletic performance. Our body doesn’t know if the rep scheme is 21-15-9 or 20-15-10, our body doesn’t know if the loading is 42 kg or 40 kg. But our body tells us if we don’t eat, sleep and move enough. And by moving I mean daily activities, not sports. If you adjust your daily habits to optimally support your training then it will have a huge positive effect on your athletic development in general. Any change should start with small steps. Don’t try to change everything at once. Creating a habit makes it more likely to last. Make a list and include everything that you would like to improve. Now rate each item on scale of 1-10. Think about how committed you are for each upcoming change from 1-10. If it´s not a 9 or 10, you probably won´t succeed. You have got to be certain. You must believe that each task you focus on is one you are able to handle. Prioritise it. If you really want something to happen, you have got to make a habit out of it. You should start with your bed! Whatever your goals are, you need enough sleep. Start by going to bed 15 min earlier than usually. Increase the time little by little, until you get to where you would like to be. You will know when the task has become a routine because it will feel natural and normal, as if you had always been doing it. A good test to know if you are sleeping enough is to check if you feel refreshed when the alarm goes off. Coaching is not just programming the workouts or correcting the movements. It is more holistic. If you really want to achieve the best results for your athletes, you’ve got to know how they spent their day. You must give your athletes the guidance to adjust the other 23 hours.